Some interesting stats about my tweets! Today I tweeted my 50,000th tweet, which is a little bit ridiculous. I've been tweeting away since 2009, and it's been a fun journey! I've met amazing people and visited new places, experienced new things, and found myself some amazing friends (including one special boy in particular). Apparently, 50,000 average sized tweets creates a timeline 1.2km high - one and a half times as high as the Burj Khalifa, and more than four times longer than the Titanic. From 2011 onwards, I got pretty heavily into Twitter. I made a whole heap of new friends, found people just as crazy as me, and learned tonnes of new things. It's been a lot of fun. If I keep tweeting at the average rate of the last three years, I'll hit 65,000 some time this year. Two and a bit years after that, I'd hit 100,000! Each section of this graph represents another year on my stack of tweets. 2011 and 2012 had some pretty big peaks as I discovered how much fun Twitter could be, while 2013 remained fairly constant through the year - I probably tweeted less because I spent a lot of the year going out and doing things with @mattRan. I tweet most on Mondays - I guess tweeting is easier to cope with than working at the start of a new week. I tweet a little bit less on the weekend too. Usually that's because I'm hanging out with the friends I made online! I've mentioned 3666 people on Twitter. These are some of the people that I've talked to the most. I've listed them here by their current Twitter handles, but the tooltip numbers count old handles as well. The biggest names on the list are @guhou, @lukeyook, and @mattRan. They've all been a pretty big part of my life for the past few years, and I love them lots. I've mentioned @guhou the most, probably because we speak the same language, which more often than not is completely nonsensical. We also tweeted about the food we ate in uni lectures a lot. Food > Study. @lukeyook invited me over for dinner at @TheMoonFortress about two and a half years ago, and in doing so introduced me to my first real post-high-school group of friends. I really can't thank them all enough for that. Finally, @mattRan. Without getting too lame, he's the most important person in my life. I met him in late 2012 after a long time tweeting, and since then we've shared all kinds of awesome things, moved in together, and had a whole lot of fun in the process! I love him to pieces, and he's yet another reason I'm grateful for this weird online Twitter thing. 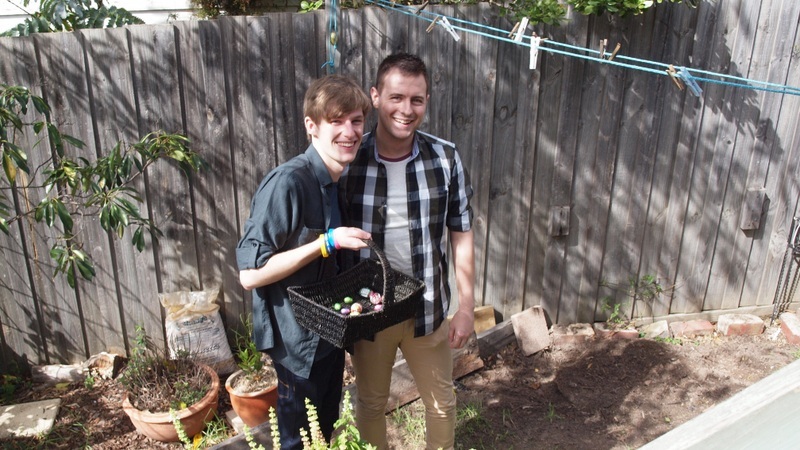 Matty and me with my family at Easter! You can see that I tweet less around lunch and dinner time. Nothing should get in the way of a delicious meal! Or a packet of Tim Tams, as the case may be. Hashtags are great. I use them a fair bit. My most used hashtags are those that I can join in a conversation with, or are a specific type of tweet. #sbseurovision is my most used hashtag, even though I only use it once a year. I really love Eurovision. Politics might frustrate me, but I still end up tweeting about #auspol and #qanda - Australian politics and the TV panel show Q&A, in case you didn't know. I've tweeted a fair few #FF follow Fridays, and my account regularly autotweets my #lastfm listening stats. Just as I was about to put this up, I got an email from Twitter informing me that it's my 5th Twitter birthday. How exciting! These stats only add up to 49720 tweets. Apparently Twitter has lost some! My guess is that the missing 280 tweets are things I've retweeted that have since been deleted, or are in accounts I don't follow that went private. If there are any other stats you'd be interested in, let me know and I'll put them up!